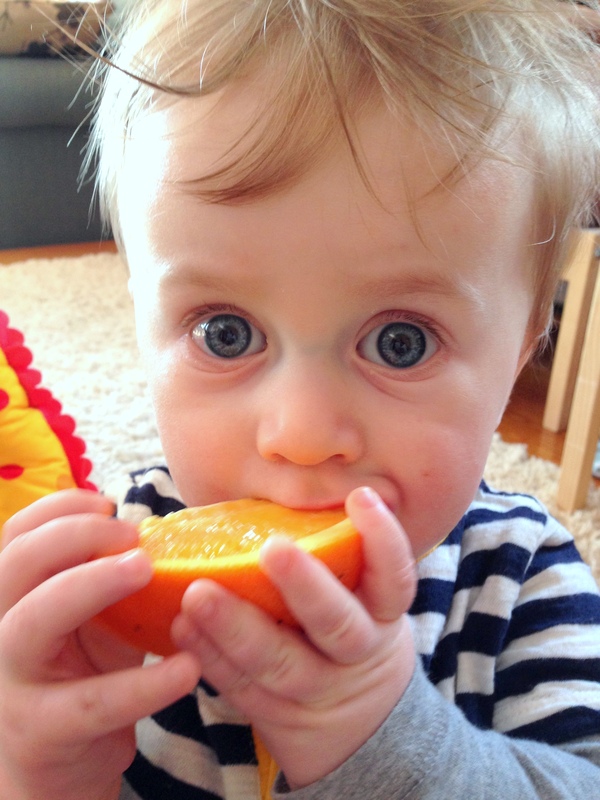 His new favorite food: oranges! 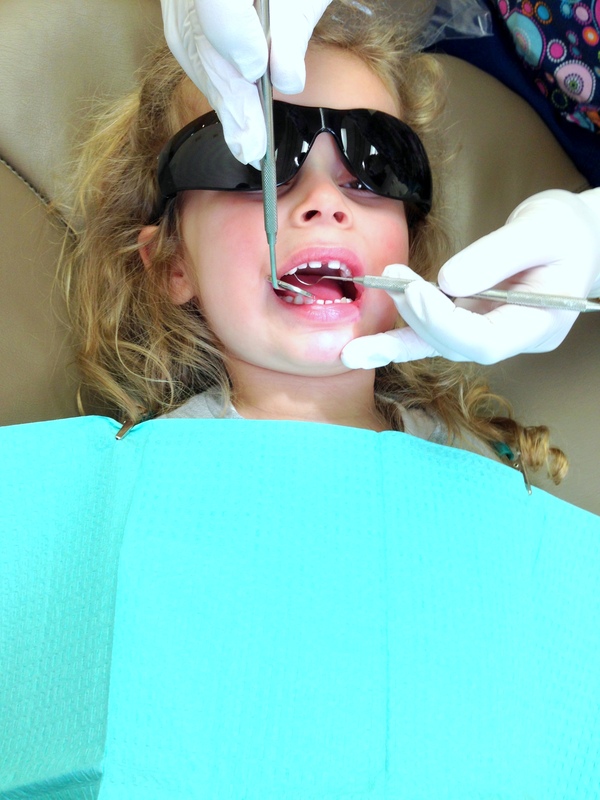 She had a wildly successful first trip to the dentist! My favorite part: when they were all done and she said “look mom!” and showed me her teeth like I would be able to notice. Her favorite part: she really won them all over and ended up with about 6 special presents from the toy chest. ps. the sunglasses are to protect her eyes from the light. 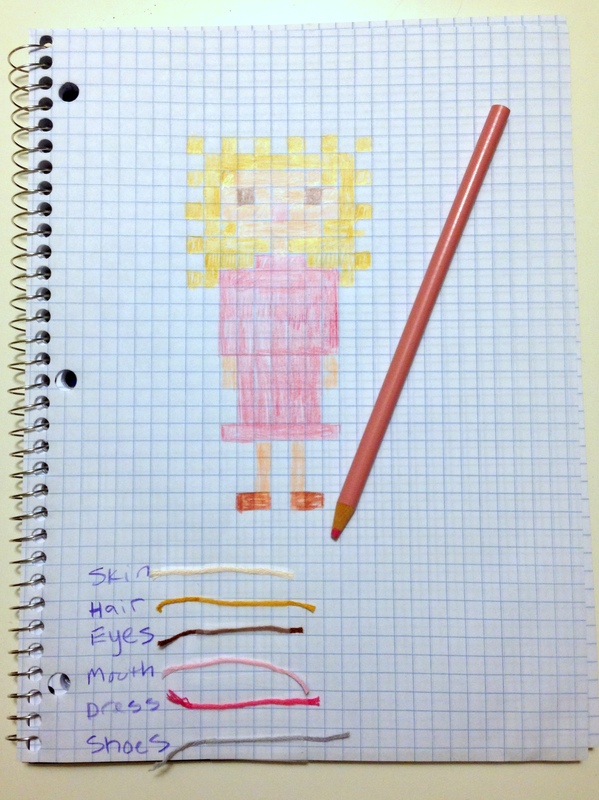 Do you cross-stitch? Cross-stitching has quickly become my new obsession, my craft of choice. But let me back up. I’ve been feeling a little….well, blah lately. 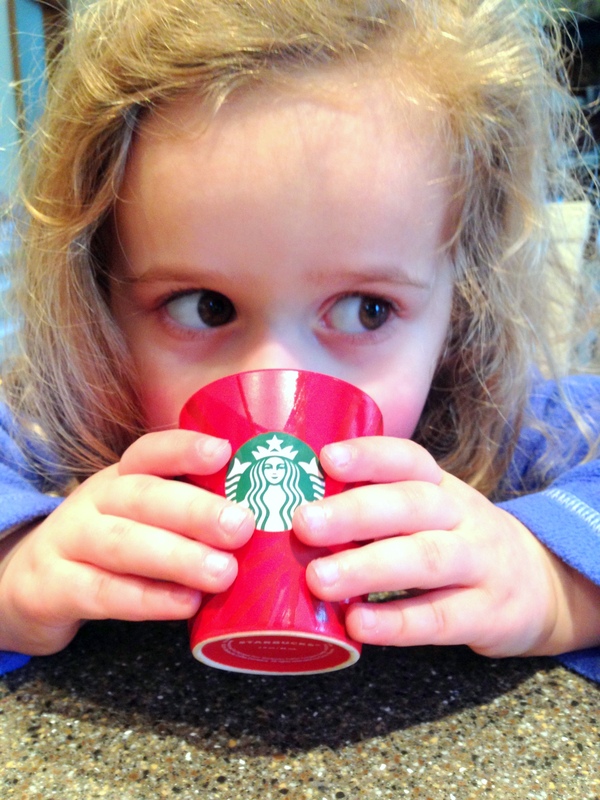 This winter – all the snow, the days stuck inside, the potty training toddler, the many, many leaks we have in our house from ice damns – it’s all just too much. Too much! And I am not one to complain about winter, I certainly prefer the cold weather (coats!) and usually think we don’t get enough snow (to ski! ), so, I needed something. Something new to be excited about. A new thing for me to spend all my free time doing (ha, free time meaning the couple hours I have after the kids go to bed before I go to bed or just fall asleep on the couch). I had some books I’d like to read all loaded on my Kindle, but then I’d fall asleep immediately. I have a bunch of great magazine subscriptions, but same problem (I also need more sleep apparently), so my search continued. Until one day I found it. 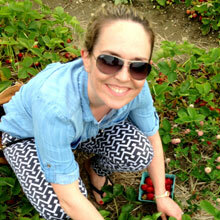 On marthstewart.com by way of the Loeffler Randall Instagram account run by their Creative Director Jessie. She grammed a photo of a cross-stitch in progress of the face of every child in her son’s class and it really caught my eye. Because I’ve cross-stitched a few times when I was little and always did little kits, and honestly any kit you find ispretty lame. But here, this woman was taking an idea from Martha Stewart where you draw your own patterns on graph paper and then stitch them – adorable! I immediately (well, within a week) ran to the craft store to buy my materials. 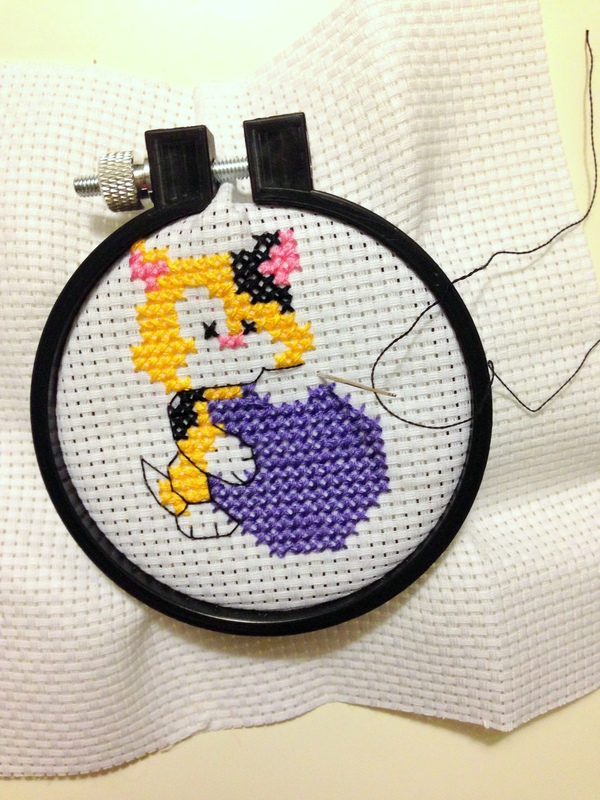 I decided to buy one of the lame kits to freshen my cross-stitch skills, I picked the one above because I thought a little someone in my house may enjoy having it framed in her room when I’m done (purple!). I’m almost done and it only took 3 nights. So now I am going to practice creating my own cross-stitch patterns and get to work on a little family portrait, maybe based on our family photos? Who knows! The ideas are endless and are swimming in my head right now. If you’re a member of my family or close friend, watch out – a cross-stitch of yourself may be in your future! What’s getting you through this winter? If you’re like me, you have a plethora of striped shirts in your closet. There’s something so simple yet stylish about a striped shirt, am I right? Wear it with jeans while running errands or dress it up with a statement necklace for a night out. In my book, a striped shirt is almost a neutral and pairs well with any bottom – brightly colored pants, denim, and even floral patterns. 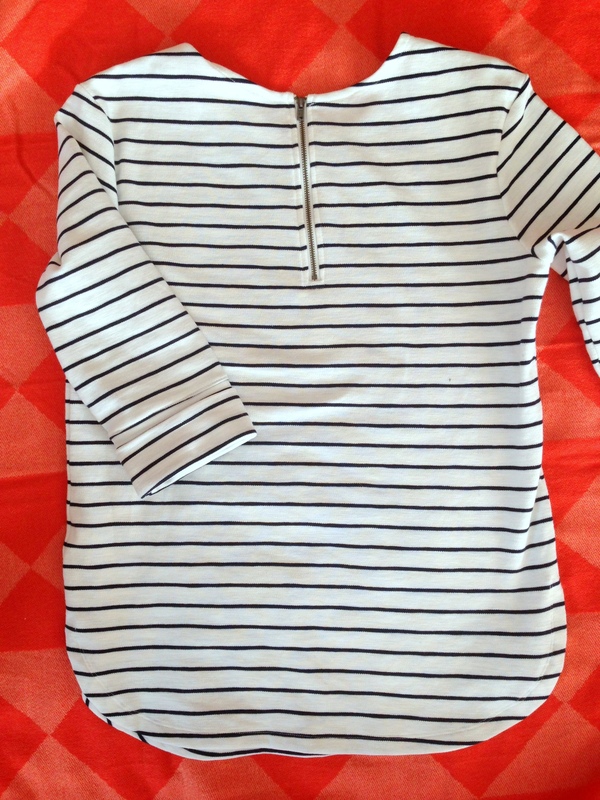 Now personally, I need another striped shirt like I need a hole in the head, BUT an affordable, decent, quality striped shirt is hard to come by these days. I always went for the shirts at J. Crew, and I don’t know about you, but I find they end up getting tiny holes in them if the material is thin or they pill around the armpits if the materials is thicker. So, when in my travels I always seem to have eyes in the back of my head keeping watch for a good-looking striped shirt. And so the story of this striped shirt is that we were at Target earlier this week and when you’re at Target around 11:30 with a toddler and a baby there is little to no time to be browsing the clothing racks – you have to get in, get what’s on your list, and get out before anyone needs to eat lunch, tinkle, or sees the dollar area. And obviously you should walk a crazy route around the store and avoid the toy aisles at all cost. But, on our way to check out and avoid the dollar area, out of the corner of my eye I spied a great looking striped shirt that I had a gut feeling about and decided immediately I needed it in my closet. I only stopped fast enough to feel the fabric (it’s so soft and thick! ), find my size, and throw it on top of our cart. 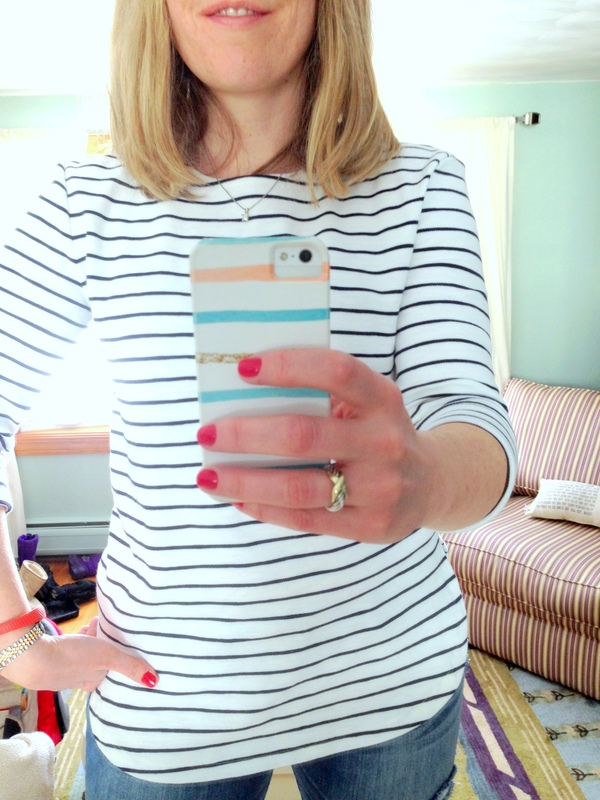 You guys – this is an awesome striped shirt that you need in your closet right now. I love the thickness of the fabric, the scoop neck, and the fabulous exposed zipper in the back – exposed zippers are a favorite of mine. And it’s only $23!!!!!!!! It’ll be a great transitional piece from now to spring. Run and get yours before they’re gone (I searched for like 15 minutes on target.com and cannot find this shirt online, maybe it’s in store only? It’s Merona brand)! And no, this is not a sponsored post, I just like to report when I find good deals on great striped shirts. Maybe I’m the last person to try this, but have you ever roasted broccoli? Broccoli is a family favorite in our house – well, in terms of green vegetables and we usually steam it and serve with a dash of garlic salt. Very good and obviously good for you. In the summer we make a broccoli slaw, we put broccoli in stir fry’s, but I wondered what else we could do with broccoli? 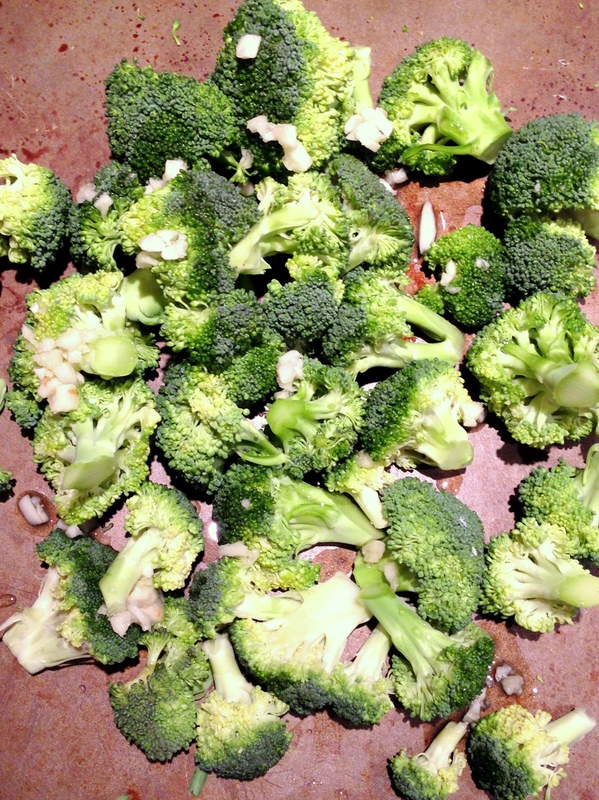 Then I thought, gee – we roast so many other vegetable, let’s roast some broccoli? I found a simple recipe on epicurious to get an idea of oven temp, etc… and it came out so great. Don’t worry if the garlic smells like it’s burning, it caramelizes and tastes great with the browned broccoli. 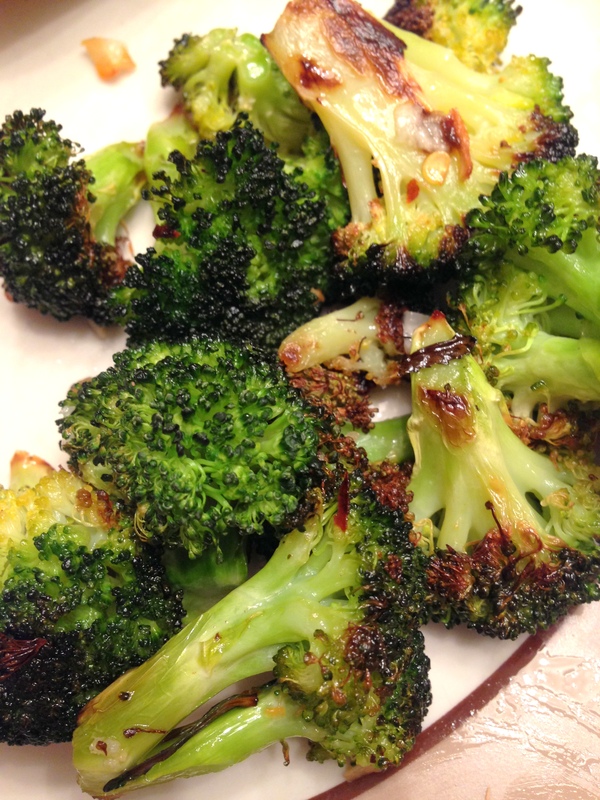 Roasted broccoli feels like a heartier side than our normal steamed broccoli – try it, let me know how you like it! 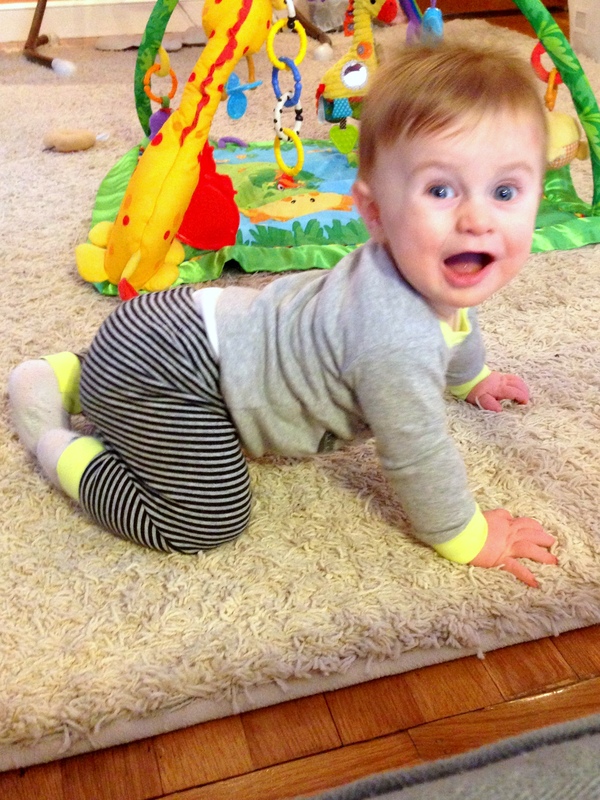 A weekly photo of my kids for one year. 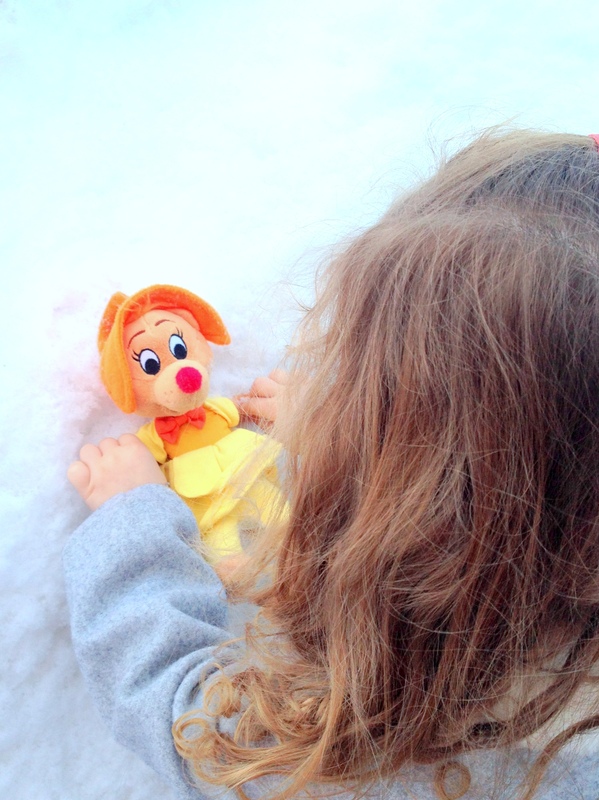 Almost every time we leave the house this stuffed mouse does a snow angel in our giant snow bank. 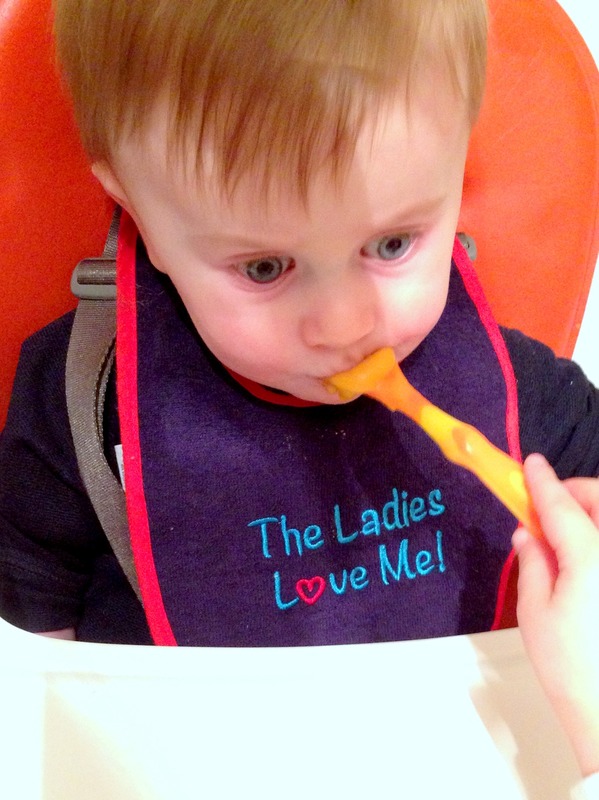 Being fed by big sister, this was a highlight of the week for both of them. Stuffed peppers are (and always have been) one of my favorite winter meals. 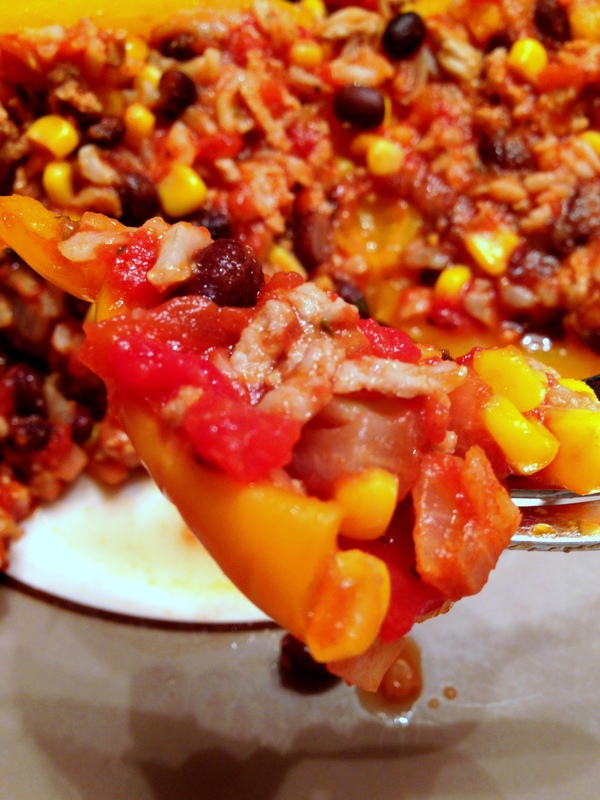 You stuff a green pepper with rice that’s mixed with ground beef, tomato sauce, maybe some corn. Yum. My mom made these a lot when we were little and I have continued the tradition on our house and now it’s one of Z’s favorite meals (well, she eats the filling but not the pepper). 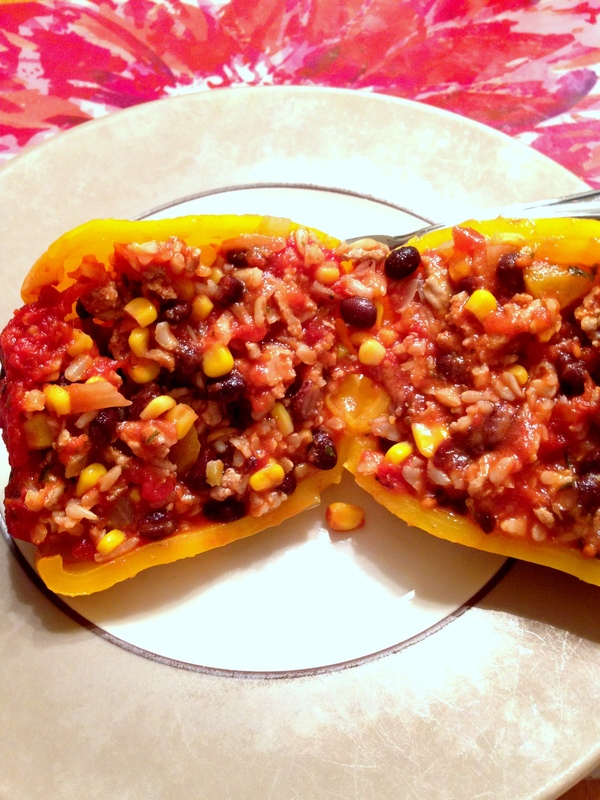 I had the idea over the weekend to add a Mexican spin to our stuffed pepper dinner this week so I thought I’d share with you what I did. Boil peppers for about 5 minutes until slightly soft, set aside in a baking dish. Saute your onions and garlic until translucent then add your turkey. 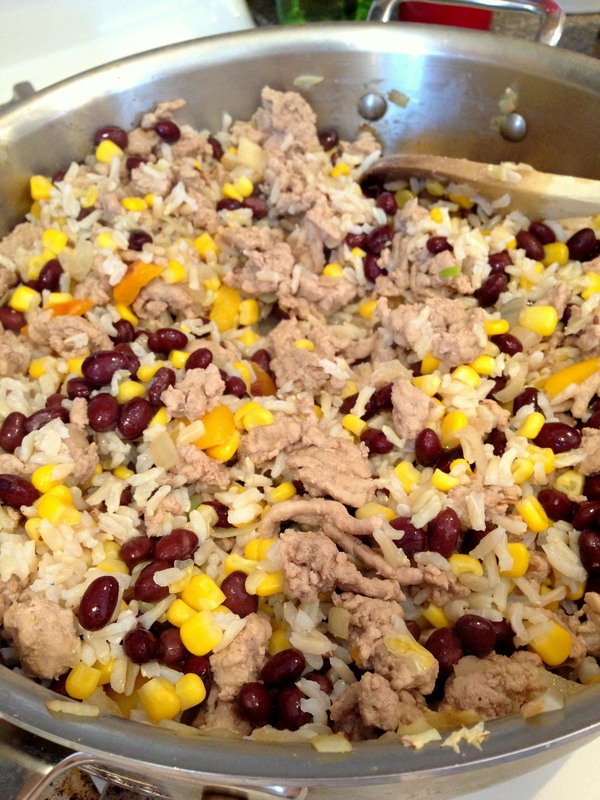 Once cooked add the rice, corn, and black beans and cook until heated through. Mix in cumin and salt & pepper followed by the tomato sauce. Fill peppers with mixture and spoon any remaining mixture into the bottom of the baking pan. Cover tops of peppers with remaining 1/2C of sauce. Bake for 30 to 4o minutes at 350 degrees. 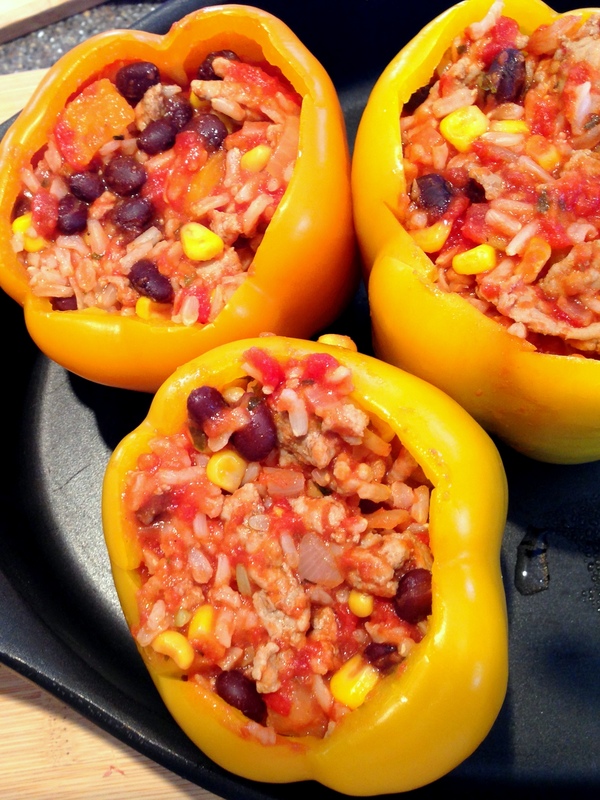 I love this Mexican spin on a classic stuffed peppers recipe. Enjoy! She LOVES all the snow we’re getting, mostly for the “hot chocolate milky” she gets when she comes inside after playing in it.